It's Kaurava Sabha, Not Dharma Porata Sabha! Former Chief Secretary IYR Krishna Rao took potshots at AP CM Chandrababu Naidu and Pro-TDP Media while responding on Dharma Porata Deeksha in Delhi. 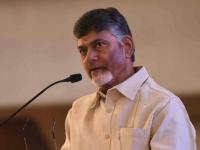 On the coverage given by Eenadu with the heading 'Chandra Garjana' and sub-title 'Chalilonu Vedi Puttinchina Dharma Porata Deeksha', IYR told he assumed the largest circulated Telugu Daily would question how could State Govt use Tax Payers Money for Dharma Porata Deekshas but it took a pro-TDP Stand. 'In my opinion, This Meeting is like sprinkling chilli powder on the bifurcation wounds,' he said. The Retired IAS described the Dharma Porata Sabha as Kaurava Sabha. He compared Ex-PM Manmohan Singh to Dhrutarashtra while sharing the paper cutting of Andhrajyothi - 'Dhrutarashtra is having a word with the CM. Sakuni can be seen in the picture. Laxman Kumar came and went. Duryodhana did not attend the meeting. Duryodhana need not necessarily be a male'. Needless to say, IYR has drawn comparison between Sonia Gandhi and Duryodhana here.